Work and life overload. Injury or illness. Seemingly endless winter weather. Physical and mental fatigue after reaching a big goal. There are all sorts of reasons for guys to just stop training. In those situations, it’s natural to wonder: 'for how long can I not train without real harm to my current fitness level'? A partial answer is that your heart starts to show significant signs of detraining after just a few weeks of little to no exercise (worried about heart health? These seven avocado recipes have got you covered). That’s the key takeaway from a new study on marathoners published in the Journal of Applied Physiology. Researchers found 21 people who after completing the 2016 Boston Marathon as charity runners, were willing to almost entirely stop exercising for eight weeks. The study subjects agreed to exercise less than two hours per week during that time, with no workout to last more than an hour. During marathon training they had averaged almost 32 miles per week, while after the marathon they averaged three to four miles per week. The researchers tested key aspects of their cardiovascular fitness two weeks before the marathon (i.e., at peak training), and repeated the tests four and eight weeks after the marathon. During the second four weeks of inactivity, the detraining changes regarding blood volume and the left ventricle stabilised. There were detraining effects in the right ventricle during this time, but, according to lead researcher Charles Pedlar, Ph.D., those changes are mostly of interest to sport cardiologists. Nonetheless, the runners’ performance on a treadmill test suffered. The test entailed the treadmill moving at five miles per hour and the gradient increasing 0.5 percent every 15 seconds until the runners quit. The average time to exhaustion decreased by five to six seconds per week in the eight weeks after the marathon. This test matches most runners’ anecdotal observations that, after a period of no running, their ability to sustain a hard pace has declined more than their ability to maintain their easy pace. The runners’ detraining wasn’t as severe as that observed in studies involving total inactivity (such as in people confined to bed for weeks at a time). “I think had we completely stopped them from exercising we would have seen a greater, more consistent detraining effect,” Pedlar, of Harvard Medical School in Boston and St. Mary’s University in the United Kingdom, wrote in an email. It’s important to note that this study looked only at some key cardiovascular components of fitness. It didn’t measure many other things that have a significant effect on how fast you are at any given moment, such as capillary density, muscular endurance, or neuromuscular coordination (how well your muscles communicate with your nervous system). Also, there’s great variability among runners in how soon they feel “off” after not running. Roger Bannister didn’t run for the five days before he became the first person to break 4:00 in the mile. Others feel like they’ve forgotten how to run after a few days off. Because of all these factors, as well as others such as genetics and lifestyle, there’s no one-size-fits-all predictor of lost fitness. Estimates of decreases in endurance performance range from 4 to 25 percent after three to four weeks of no exercise. Pedlar suggests remaining minimally active, for both fitness and health reasons, even during a purposeful recovery phase. 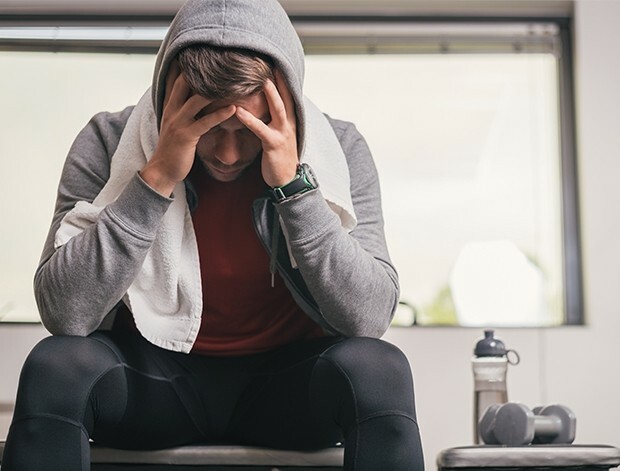 In a recent review of research on how people’s moods changed after voluntarily giving up exercise, the subjects’ anxiety and depressive symptoms began to worsen significantly after two weeks. Our bodies and minds seem to be in sync on this issue – having more than a few weeks of inactivity means forfeiting some of the key benefits of running.